Transcranial doppler is a non-invasive method that measures the blood flow velocity and the direction of cerebral blood vessels through the doppler principle. 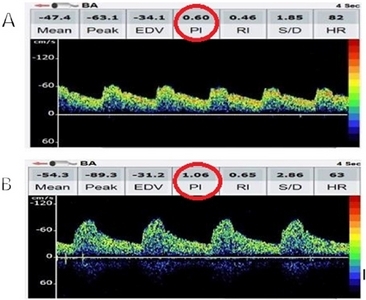 The pulsatility index is an index for measuring the transcranial doppler that reflects the distal vascular resistance and is used as an index for the presence and diffusion of cerebral small vessel diseases. The purpose of this study was to evaluate the risk factors affecting the basilar artery pulsatility index in ischemic stroke patients. From January 2014 to May 2015, 422 patients were selected by measuring the transcranial doppler pulsatility index, considering their basilar artery pulsatility index. Univariate analysis was performed using the basilar artery pulsatility index as a dependent variable. Multiple regression analysis was performed considering the factors affecting the pulsatility index as variables. Univariate analysis revealed age, presence of hypertension, presence of diabetes mellitus, presence of hyperlipidemia, and hematocrit (P<0.1) as factors. Multiple regression analysis showed statistically significant results with age (P<0.001), presence of diabetes (P=0.004), and presence of hyperlipidemia (P=0.041). The risk factors affecting the basilar artery pulsatility index of transcranial doppler were age, diabetes, and hyperlipidemia. Further research will be needed to increase the cerebral pulsatility index as a surrogate marker of the elderly, diabetes, and hyperlipidemia. Transcranial doppler ultrasonography (TCD) is a non-invasive method that projects 2 MHz low-frequency ultrasound to measure blood flow velocity and the direction of cerebral blood vessels in the Circle of Willis . TCD examination is widely applicable as a bedside screening tool due to its simplicity in assessment and relatively low costs. TCD is performed through four acoustic windows and the suboccipital window usually allows recognition of the basilar artery (BA) [2, 3]. Compared to the temporal window, measurement of the basilar artery through the suboccipital window is advantageous because it has a low ratio of poor acoustic window (Figure 1). 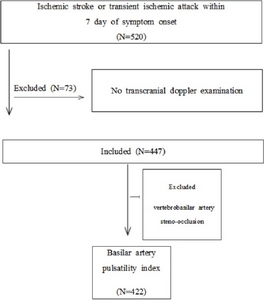 Comparison of transcranial doppler basilar artery pulsatility index. (A) Normal pulsatility index (B), Elevated pulsatility index. Mean flow velocity (MFV) and Pulsatility Index (PI) were known to be representative parameters for TCD examination. Especially, PI was originally designed by Gosling to measure distal vascular resistance and it has also been used as an index of cerebral microangiopathy . In addition, previous studies have reported that PI was associated with hypertension, diabetes, aging, intracranial arterial stenosis and intracranial arterial calcification [5-8]. Brain computed tomography (CT) and magnetic resonance imaging (MRI) are commonly used to diagnose small vessel diseases. However, CT has poor resolution and the cost of screening is limited for MRI (Figure 2). On the other hand, TCD is a relatively inexpensive method and can be easily used as a screening test to evaluate cerebrovascular dynamics [7-8]. As previously mentioned, PI has been shown to be associated with various vascular risk factors. However, several differences were present in study subjects, choice of blood vessels and variables of blood risk factors in the past studies. Therefore, we tried to clarify these problems by selecting the basilar artery as a target vessel, which is comparatively easy to measure, and that has fewer defective acoustic windows. Moreover, we also suggested 3 different models by considering the characteristics of each variable. In a current study, we investigated risk factors affecting basilar artery pulsatility index of TCD in patients with ischemic stroke. 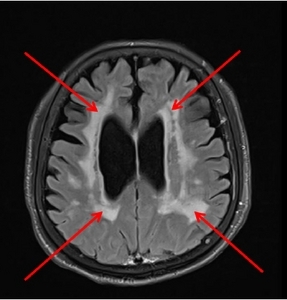 Signs of cerebral small vessel disease (Magnetic Resonance Imaging). Changes of white matter in brain can be seen on MRI. To evaluate the risk factors affecting basilar artery pulsatility index, a single-centered retrospective study was conducted in patients with ischemic stroke enrolled in a stroke registry of the Department of Neurology, Chung-Ang University Hospital. We initially identified 520 patients admitted to our hospital from January 2014 to May 2015 with acute ischemic stroke or transient ischemic attack (TIA) and assigned to either MRA (magnetic resonance angiograpy) or CTA (computed tomogram angiography). Subjects without TCD results or who had more than 50% stenosis or occlusion in vertebrobasilar artery were excluded. 422 patients were qualified for the final analyses. This was approved by the Institutional Review Board at Chung-Ang University Hospital and patients written consents were exempted (Figure 3). Acute ischemic stroke refers to either a rapid focal or total neurological dysfunction lasts more than 24 hours or death within one week of onset of symptom without any other reason other than cerebrovascular disease. Transient ischemic attack refers to a localized brain dysfunction that is caused by a cerebral blood flow disorder and is normally recovered within 24 hours [9, 10]. All TCD studies were performed as a general test after admission, and were performed with a 2 MHz probe using Companion III (Nicolet EME, UK). Patients’ doppler signal through a suboccipital window was measured as recommended in a resting state. TCD was examined at a depth of 80 to 100 mm and at least 2 measurement depths were changed [2, 3]. Values with strong signals and high blood flow velocity were chosen and PI was automatically calculated on TCD. If the sensitivity was weak and automatic calculation was impossible, PI was calculated as follows: PI=(Peak systolic velocity (PSV)−End diastolic velocity (EDV))/Mean flow velocity (MFV) . All TCD studies were performed by 1 trained technician, and the study results were reported by 1 board-certified neurologist. We reviewed and analyzed the laboratory test results and cardiovascular risk factors from the registry. (1) Hypertension: Having received anti-hypertensive medications or having systolic blood pressure (BP)>140 mmHg or diastolic blood pressure (BP)>90 mmHg on measurement 1 week after stroke onset. (2) Diabetes mellitus: Having taken antidiabetic medications or having a fasting blood glucose level>126 md/dL. (3) Smoking: Current smoker or having a regular smoking habit in the past. (4) Hyperlipidemia: Having taken a lipid-lowering agent, total cholesterol level>220 md/dL or low-density lipoprotein cholesterol level>160 md/dL. Previous histories of stroke, ischemic heart disease, and atrial fibrillation were also considered as risk factors. Laboratory test results such as WBC, homocystein and HbA1c were also included in the analyses. The descriptive data were expressed as mean±SD or percentage. PI of the basilar artery was the dependent variable and categorical variables such as groups, age, gender, presence of hypertension, presence of diabetes mellitus, presence of hyperlipidemia, status of smoking, presence of ishemic heart disease, presence of atrial fibrillation and the previous history of stroke were the independent variables. The one-way ANOVA and t-test were performed to assess the significance of differences of these variables among groups. In addition, Pearson correlation tests were conducted for continuous variables like laboratory data. Multiple regression analyses were used to examine the relationship between PI and each component. All statistical analyses were conducted using R (version 3.2.5) and P-values less than 0.05 were considered statistically significant. A total of 422 individuals (214 (51%) male and 208 (49%) female) were finally selected. The mean age was 68 years old. They were found to have hypertension (N=285, 68%), diabetes mellitus (N=138, 33%), hyperlipidemia (N=87, 21%), smoking (N=124, 29%), ischemic heart disease (N=42, 10%), atrial fibrillation (N=94, 22%) and history of stroke (N=77, 18%). To identify variables affecting PI value of the basilar artery, several clinical characteristics were analyzed. As age increased, PI increased significantly (P<0.001). In female, PI was slightly higher than in male but it was not statistically significant (P>0.054). Significant increase of mean PI values was observed in the presence of hypertension (P<0.001). Similarly, mean PI values were higher in the presence of diabetes and hyperlipidemia (P< 0.001 and P=0.003, respectively). There was no significant difference in smoking, ischemic heart disease, atrial fibrillation and history of strokes (Table 1). Abbreviations: BA, basilar artery; PI, pulsatility index. PI showed positive relationship with various clinical factors like WBC, fasting blood sugar, LDL, homocystein, HbA1c, while it showed negative relationship with total cholesterol, HDL and triglyceride (P>0.05). However, all of these factors were not statistically significant. On the other hand, hematocrit displayed significant correlation (P=0.046) (Table 2). Abbreviations: r, correlation coefficient; BA, basilar artery; PI, pulsatility index; WBC, white blood cell count; HDL, high density lipoprotein; LDL, low density lipoprotein; HbA1c, hemoglobin A1c. Based on mean and correlation analysis, PI was affected by age, gender, presence of hypertension, presence of diabetes mellitus, presence of hyperlipidemia, and laboratory data such as homocystein, HbA1c and hematocrit (P<0.1). To further examine the factors affecting PI of the basilar artery, we then performed multiple regression analysis. Model I had fasting blood glucose, total cholesterol, LDL. and Triglyceride as continuous variables; Model II had fasting blood glucose as a continuous variable and presence of hyperlipidema as a dichotomous variable; Model III had presence of diabetes mellitus and presence of hyperlipidemia as dichotomous variables. In Table 3 (model I), multiple regression analysis was conducted with an adjustment of age, gender, hematocrit, presence of hypertension, fasting blood glucose, total cholesterol, LDL, triglyceride and homocystein. Age and hypertension were independent determinants of BA PI (P< 0.001 and P=0.030, respectively). However, PI of the BA was not significantly associated with gender, hematocrit, fasting blood sugar, total cholesterol, LDL, triglyceride and homocystein (P>0.05). Abbreviations: B, unstandardized coefficient; Beta, standardized coefficient; BA, basilar artery; PI, pulsatility index; LDL, low density lipoprotein. Table 4 (model II) shows the results with an adjustment of age, gender, hematocrit, presence of hypertension, fasting blood glucose, presence of hyperlipidemia and homocystein. Age (P<0.001), presence of hyperlipidema (P=0.029) and homocystein (P=0.030) were significantly associated with PI of the BA. However, there was no statistically significant association between PI of the BA and gender, hematocrit, presence of hypertension and fasting blood glucose (P>0.05). Abbreviations: B, unstandardized coefficient; Beta, standardized coefficient; BA, basilar artery; PI, pulsatility index. When adjusted with age, gender, hematocrit, presence of hypertension, presence of diabetes and presence of hyperlipidemia and homocystein in model III, age (P< 0.001), presence of diabetes (P=0.004), and presence of hyperlipidemia (P=0.041) were the independent determinants of PI of BA (Table 5). There was no statistically significant association between gender, hematocrit, presence of hypertension and homocystein (P>0.05). A coefficient of determination of each model is as follow: Model I, 0.233: Model II, 0.241: Model III, 0.253. In addition, a standardized coefficient was 0.447 (age), 0.125 (presence of diabetes) and 0.089 (presence of hyperlipidemia), respectively. The PI of TCD ultrasonography has been used to provide information for downstream cerebral vascular resistance. Increased pulsatility index has also been suggested as an index of presence and severity of diffuse small vessel diseases [6, 8, 11]. Previous studies have demonstrated that increased PI was associated with age , hypertension , diabetes , intracranial arterial stenosis , intracranial arterial calcification , and increased total plasma homocystein level . Therefore, the purpose of this study was to investigate risk factors affecting PI of the basilar artery, which can be easily monitored by TCD. We showed that PI of the BA was significantly increased with age. Previous studies have also suggested an association between age and PI [14, 17]. Therefore, it seems that elderly is an important risk factor for the spread of small vessel disease. However, mean PI was not significantly affected by gender. In addition, there was no significant association between gender and PI consistent with a previous result . Gender was not found to be a factor affecting basilar artery pulsatility index. No significant association between hematocrit and PI was displayed in all models (P>0.05). Hematocrit is more likely related to mean flow velocity rather than the PI due to an influence of blood viscosity . Mean PI of the BA was significantly increased in the presence of hypertension (P<0.001). In multiple regression analysis, PI also had a significant relationship with the presence of hypertension in model I (P=0.030), but not in model II and III (P>0.05). Kidwell et al reported that an increase of PI was closely associated with hypertension in small vessel disease . Discrepancies between these results might be due to the fact that subjects with other than stroke patients were included in the previous study. Presence of diabetes affected the mean PI of BA significantly (P<0.001). Moreover, PI was significantly associated with diabetes (P=0.004). In a previous study, it has also been reported that diabetes increases the PI of the cerebral arteries in type II diabetic patients . Therefore, diabetes appears to be an independent risk factor affecting PI. Accordingly, mean PI of the BA was significantly increased in the presence of hyperlipidemia (P=0.003). Close association between PI and hyperlipidemia was observed in multiple regression analysis (P<0.05) as well. This suggests that the presence of hyperlipidemia increases the basilar artery pulsatility index and is a factor affecting the spread of cerebrovascular disease. Lim et al. have reported an increase of plasma total homocysteine (tHcy) as an independent factor for elevation of PI in intracranial arteries . We found positive correlation between plasma homocysteine and PI but it was not statistically significant (P=0.05). Moreover, close association was shown in model II (P=0.039), but not in model I and III (P>0.05). These discrepancies might be due to differences in subject populations or relationship between the variables. Considering the increment of intracranial arteries PI, homocysteine may be an important factor for small vessel disease. There were several limitations in our study. First, TCD examinations were performed on patients hospitalized with acute ischemic stroke or transient ischemic attack in one university hospital. Moreover, it is important to note that elevation of PI of the BA has shown a significant association with old age, diabetes and hyperlipidemia, but this does not indicate a causal relationship. Additionally, several factors such as intracranial pressure, cardiac output and respiration, that potentially affect the PI of the cerebral arteries were not considered in our study. Stroke subtype, NIHSS (National Institutes of Health Stroke Scale), cerebral infarct volume were not investigated either in our study. However, all of the TCD tests were performed in a routine manner before the treatment, and there was little difference between the time intervals. Doppler signals in particular were obtained in a stable state at the time of TCD examination and various laboratory test results were also included in the analyses. In addition, status of blood vessels in the Circle of Willis were carefully evaluated to exclude stenosis or occlusion. In summary, we have discovered that PI of the BA was affected by old age, diabetes mellitus and hyperlipidemia in patients with acute ischemic stroke or transient ischemic attack. Thus, those conditions could be risk factors influencing intracranial small vessel disease. Moreover, the increase in basilar artery pulsatility index of TCD may be a useful physiological indicator for elderly, diabetes, and hyperlipemia. To better understand the risk factors affecting PI, more studies are needed in subjects including non-stroke patients. Appropriate control of PI variables may lead to discovery of additional vascular risk factors. 뇌혈류 초음파 검사는 비침습적인 방법으로 대뇌 혈관 혈류속도와 방향을 도플러 원리로 측정하는 검사이다. 뇌혈류 초음파 검사의 박동지수는 원위부 혈관 저항을 반영하는 측정 지표이며 대뇌 소혈관 질환 발생과 확산지표로 사용되고 있다. 본연구의 목적은 허혈성 뇌졸중 환자에서 기저 동맥의 박동지수에 영향을 미치는 위험 인자를 평가하는데 있다. 2014년 1월부터 2015년 5월까지 내원 환자를 대상으로 뇌혈류 초음파 검사 박동지수를 측정하여 기저동맥 박동지수 대상자 422명을 선정하였다. 기저동맥 박동지수를 종속변수로 하여 단변량 분석을 실시하였고, 박동지수에 영향을 미치는 인자를 변수에 특징을 고려하여 다중회귀 분석을 실시하였다. 단변량 분석 결과 박동지수에 영향을 미치는 인자는 연령, 고혈압 유무, 당뇨 유무, 고지혈증 유무, 적혈구용적으로 나타났다(P<0.1) 다중회귀분석을 실시한 결과 연령(P<0.001), 당뇨 유무(P=0.004), 고지혈증 유무(P=0.041)가 통계적으로 유의한 결과를 보였다. 뇌혈류 초음파 검사의 박동지수에 영향을 미치는 위험인자는 고령, 당뇨, 고지혈증이다. 이후 추가적인 연구를 통하여 두 개 내 박동지수 증가는 고령, 당뇨, 고지혈증을 반영하는 지표로 활용 될 수 있을 것으로 생각된다. This manuscript is an addition based on the first author’s master’s thesis from Chung-Ang University. Jeong HT1, M.T. ; Kim DS2, Professor; Kang KW3, M.T. ; Nam YT4, M.T. ; Oh JE5, M.T. ; Cho EK2, Adjunct professor. Wechsler LR, and Babikian VL. Transcranial Doppler sonography: clinically useful. Arch Neurol 1994;51:1054-1056. Tripp LD, and Warm JS. Transcranial doppler sonography. Neuroergonomics: The brain at work, Raja P, and Matthew R. New York: Oxford university press; 2007 p. 82-94. Aaslid R. Transcranial doppler sonography. New York: Springer science & business media; 2012. Gosling R, and King D. The role of measurement in peripheral vascular surgery: arterial assessment by Doppler-shift ultrasound. Amsterdam: SAGE publications; 1974 p. 447-449. Bellner J, Romner B, Reinstrup P, Kristiansson KA, Ryding E, and Brandt L. Transcranial Doppler sonography pulsatility index (PI) reflects intracranial pressure (ICP). Surg Neurol 2004;62:45-51. Lee WJ, Jung KH, Ryu YJ, Lee KJ, Kim JM, and Lee ST et al. Progression of cerebral white matter hyperintensities and the associated sonographic index. Radiology 2017;284:824-833. Park KY, Chung PW, Kim YB, Moon HS, Suh BC, and Yoon WT. Increased pulsatility index is associated with intracranial arterial calcification. Eur Neurol 2013;69:83-88. Hatano S. Experience from a multicentre stroke register: a preliminary report. Bull World Health Organ 1976;54:541. Lee YS, Yoon BW, and Roh JK. A clinical study of transient ischemic attacks preceding cerebral infarcts. J Korean Neurol Assoc 1996;14:9-16. Lee KY, Sohn YH, Baik JS, Kim GW, and Kim JS. Arterial pulsatility as an index of cerebral microangiopathy in diabetes. Stroke 2000;31:1111-1115. Ackerstaff R, Keunen R, Pelt W, Swijndregt AM, and Stijnen T. Influence of biological factors on changes in mean cerebral blood flow velocity in normal ageing: a transcranial doppler study. Neurol Res 1990;12:187-191. Cho SJ, Sohn YH, Kim GW, and Kim JS. Blood flow velocity changes in the middle cerebral artery as an index of the chronicity of hypertension. J Neurol Sci 1997;150:77-80. Lee KO, Park JH, Choi YC, Han SW, Nam HS, and Heo JH et al. Increased pulsatility index in acute lacunar infarction with type II diabetes. J Korean Neurol Assoc 2005;23:457-462. Sharma VK, Tsivgoulis G, Lao AY, Malkoff MD, and Alexandrov AV. Noninvasive detection of diffuse intracranial disease. Stroke 2007;38:3175-3181. Lim M-H, Cho YI, and Jeong SK. Homocysteine and pulsatility index of cerebral arteries. Stroke 2009;40:3216-3220. Park JS, Kim CS, Kim HJ, Nam JS, Noh TW, and Ahn CW et al. Relation between cerebral arterial pulsatility and insulin resistance in type 2 diabetic patients. J Korean Diabetes 2006;30:347-354. Isikay CT, Uzuner N, Gucuyener D, and Ozdemir G. The effects of hematocrit and age on transcranial Doppler measurements in patients with recent ischemic stroke. Neurol India 2005;53:51.